New plans have been revealed for a proposed residential tower just steps from U.S. Bank Stadium. Ryan Companies has been working since 2014 on plans for a new tower that would rise on a small plot of land next to the Mills Fleet Farm parking ramp. When the ramp was constructed there were always intentions to also build a tower of some sort, whether that tower would be a hotel, office, or residential space was the question. In 2018 Ryan Companies released plans for a residential tower that would be constructed on the site located at 710 S 4th Street. At the time a 25-story building was planned that would have included 245 apartments. One of the downfalls of that proposal was that there was no retail space planned within the project which many felt was a huge miss due to the site’s proximity to U.S. Bank Stadium. New plans for a 305’ 24-story building will be presented to the Minneapolis Planning Commission at their next meeting. With the new proposal more apartment units have been added to the development along with a small amount of retail space on the ground floor. In total, the building would house 342 apartments on floors 2-23 ranging in size from micro units to two-bedroom units. Floors 22 and 23 would also include penthouse units which are expected to feature larger square footages and upgraded finish packages. 120 parking stalls would be located on one level of underground parking and three above ground levels. 1,070 square feet of retail space would be also located on ground floor towards the middle of the building. Residents would have access to a number of different amenities located throughout the building. The first floor would feature an expansive lobby along with a bike maintenance and electric scooter charging room, a pet spa and an outdoor pet run. Level two would feature leasing space, work space and more indoor amenity space. Level six of the building would include additional indoor amenity space along with a large outdoor amenity deck with a number of different sitting areas, fire pits, outdoor kitchens and walking trails. Last but not least, residents would have access to a top floor amenity level located on floor 24 which would include over 7,500 square feet of indoor amenity space along with a 3,400 square foot outdoor pool terrace. Ryan Companies would develop the building and The Excelsior Group would own and manage the property once complete. Construction could begin later this year with an anticipated completion in 2021. Renderings have been surfaced for a massive renovation of one of Minneapolis’ tallest towers. City Center, located at 33 S Sixth Street, is set to receive a large-scale renovation that would touch both the exterior and interior of the building. Leasing documents that have surfaced show that with the renovation a potential rebranding of the mall space could occur which would tentatively be called “CC33”. Last year City Center 33 South Property LLC bought the 51-story building for a record $320 million dollars. With the purchase announcement the new owner stated that an extensive renovation of the building was in the works with the hopes that it would attract new retail tenants to fill some of the nearly 50,000 square feet of vacant retail space within the mall area. The renovation would bring a new modern look to the exterior base of the building transforming today’s non-active façade into a vibrant facade. Renderings within the leasing document show wood accents and metal work cladding the exterior of the building along with two spots for what appears to be digital signage opportunities. The interior would also receive updates to its look which might even include a pop-up wine bar within the large atrium space. And let’s be honest, a wine bar is sure to be an after work hit with the thousands of employees that work in the nearly 50 stories of office space within the building. As with all projects renderings can always change so there is a chance that as tenants are secured or as more details are solidified in regards to the renovation that these images could change. Colliers International has been selected as the real estate company who is in charge of securing new tenants for the vacant retail space. The project is managed by Ryan Companies and was designed by DLR Group. At the moment an official construction start date has yet to be announced. Lululemon is setting up shop in the North Loop. The company will open their fifth Twin Cities location this April in a 2,741 square foot space at 124 N 3rd Avenue. The historic building they will call home was recently renovated and restored by Paster Properties. Fairgrounds Craft Coffee and Tea, a popular coffeehouse from Chicago, also has a location within the building that opened on the ground floor last fall. Lululemon will add to the ever-growing list of retailers opening within this particular area of the North Loop. National chains such as Warby Parker and Bonobos both have stores just blocks away, but it’s not just national chains setting up shop. A number of local shops have also opened within the area including Parc Boutique, HOUSER and Filigree Jewelers. Sherman's most recent proposal for a mixed-use project at 800 Washington Avenue S.
The City of Minneapolis issued a RFP (request for proposals) for a 0.56 acre site located at 800 Washington Avenue S back in April, today the proposals were revealed. Before we start explaining the proposals let us tell you that it wasn't the first time the city was seeking development proposals for the site. In 2015 the city also submitted a RFP for 800 Washington Avenue S and it received a number of proposals for the site. In the end the city chose a 10 story proposal from Mortenson that would have included a 235 room Hyatt Centric hotel along with 15,000 square feet of office space for the adjacent American Academy of Neurology (AAN) to expand into. However, those plans never came to fruition and shortly after Mortenson was chosen the company walked away from the site. That brings us to today, a day in which the city of Minneapolis reveals the four proposals it received during round two, one of those proposals being from one of the original developers seeking to build on the site. Let's start with that proposal. In 2015 Sherman Associates submitted a proposal for a 9 story mixed-use building with a 140 room Kimpton Hotel, 15,700 sqf of office space on the third floor for Sherman Associates new headquarters, and a 25,000 sqf Pinstripes bowling alley on the first and second floor. The proposal submitted the second time around looks somewhat similar on paper, however a shift from hotel rooms to apartments has occurred while the exterior design has also been updated. This time around Sherman Associate's proposal is for a 10 story mixed-use building. The first and second floor would still include a Pinstripes bowling alley, the third story would still be home to office space, this time around space for the AAN, and the remaining floors above would instead be devoted to 112 apartments. 20 percent of the housing units proposed would be affordable units for those making less than 60% of the area's median income. The estimated cost for the project would be around $54 million. AECOM, a developer based out of LA, has proposed a mixed-use project that would be eight stories tall. Little was given on the details of the project, however the building would house 76 for sale condo units along with office space for AAN on the lower floors. More information should be available in the coming weeks about this proposal. Based out of Excelsior, MN, Oppidian Investment Company has pitched a six to eight story building that would be entirely commercial. The goal would be to attract a large office tenant that would lease a majority of the space within the project. Developers state the the building would be perfect for a company who is "image conscious" and a company that "values a human-scale building — not one for 20 tenants in a 250,000-square-foot building." Overall the Oppidian's proposal is expected to cost somewhere between $40-$60 million. Oppidian is also currently developing The Capp, a mixed-use project under construction off of Hiawatha Avenue in Minneapolis. That project made the headlines earlier this year as it will be home to Cub Foods first ever small-format store. In addition to the 46,000 square foot grocery store, there will also be 3,100 sqf of additional retail space, 148 apartment units located on five of the upper levels of the project, and a public plaza. A local startup firm based out of St. Louis Park is proposing a five story, 72,000 square foot building with ground floor retail space and offices on the upper floors. 45 North Group has stated that the building would be energy efficient, even qualifying as "net zero," meaning that the project would generate as much energy as it uses. This would be achievable due to an expansive set of solar panels planned for the top of the building. No overall price for the project was given. We'll have more information for the proposals mentioned above in the coming weeks. Another mixed-use project is being planned for the Prospect Park neighborhood, this time around it won't be student housing, but rather Senior Living units. Located at 22 Malcolm Avenue SE, "Prospect Park Senior Living" will be constructed on a site that is currently home to a day care center, industrial building, and multiple surface parking lots. The building itself will feature three varying building heights going from four stories, to six, and at its highest point, standing ten stories tall. The project will be home to 283 senior living residential units and 8,700 square feet of retail. 6,634 square feet of that retail space would be found within the four story section of the building fronting University Avenue and would be home to a child care center. Most likely the day care space will be home to Children's Village Montessori Day Care as their current home will be torn down in order to make way for the new project. Another retail space of 2,144 square feet will be located at the back left corner of the building on the corner of 30th Avenue SE and 4th Street SE. Perfect home for a Starbuck's? This project will serve an underdeveloped area within the housing market; the senior citizen sector. All 283 residential units within the building will be devoted to senior citizen living, however not all them will be the same format or living situation. In the six story section of the building that will front 4th Avenue SE (at the backside of the lot) there will be 118 individual living units. These units will be more like a traditional apartment, however they will still have access to the medical care and 24 hour monitoring that the other units within the project will have access to. The 10 story section of the building, which will front Malcolm Avenue SE on the East side of the site, will be home to a total 177 additional residential units. 54 of those residential units will be Memory Care units and will be home to senior citizens with memory loss diseases such as Alzheimer's. The remaining 123 units will be Assisted Living units and will be home to senior citizens who need care and aid with everyday tasks. This project is just the latest to surface in an area that is seeing an explosion of growth. Next door, The Link, will open in May. That project will offer over 325 residential units aimed at working professionals and students, along with 41,000 square feet of retail space. About 30,000 square feet of that space is already spoken for and will be home to a Fresh Thyme Farmers Market which will open this summer. Behind that project another residential project, The Green on Fourth, is planned. That project will bring a six story residential building with 243 residential units. To its left, 4th Street Lofts is being planned, which will be another 6 story residential building that will be home to 163 units. If you go to the right side of the The Green on Fourth, ANOTHER residential building is being planned that will be 5 stories tall and be home to 70 residential units. To top it all off, the area behind all of these projects is also undergoing a redevelopment. Malcolm Yards Market, a new food hall, is expected to open sometime this year in a historic building that is being restored and expanded. In addition, Midwest Climbing will be opening a new climbing facility in the area in a few years. Lastly, a developer has recently proposed an additional mixed-use project off of Malcolm Avenue SE that would include over 50,000 square feet of retail space along with residential units and potentially office space. Do we really need to say it? This area is BOOMING. If you're curious to see where all the projects mentioned above are located, take a look at our Development Map. It's packed with information and images. Prospect Park Senior Living is expected to be completed in early 2019. Sephora will open their first Minneapolis location in the heart of Uptown come Spring 2018. The new store will be located at Calhoun Square at 3001 Hennepin Avenue in a space that formerly housed an AT&T location. The ground floor retail space covers 4,411 square feet and has access from both the interior and exterior. This marks a major land for Calhoun Square. While the center underwent a renovation and relocation of its main entrance a few years ago when it was acquired by Ackerberg Group, it has still struggled to retain tenants within prime retail spaces on the corner of Hennepin and Lake Street along with some interior spaces. However, recently the center seems to have struck gold, not only landing Sephora, but also Fig + Farro, a new restaurant that will open in January on the ground floor in the former Parella space. The center also became the new home for Roat Osha which took over the space on the second floor that was formerly home to Chang Mai Thai. While Sephora may be new to the neighborhood, it won't be the only beauty retailer that has set up shop. MAC has had a location for a number of years across the street at the corner of Hennepin Avenue and Lake Street, while the Urban Outfitters and Victoria's Secret locations directly across the street also carry beauty products. Sephora currently has four freestanding locations within the Twin Cities, however there are 10 more locations found within various JCPenney locations in the metro. Sephora plans to open in Spring 2018 at 3001 Hennepin Avenue in Calhoun Square. Another one bites the dust...and we're talking about surface parking lots. One of the last remaining pieces of land in the Mill District will soon have a new building rise upon it's soil. Two developers have have submitted plans to the City of Minneapolis for mixed-use developments on what is currently a surface parking lot at 205 Park Avenue. Sherman Associates has submitted plans for mixed-use development designed by Minneapolis based ESG Architects. 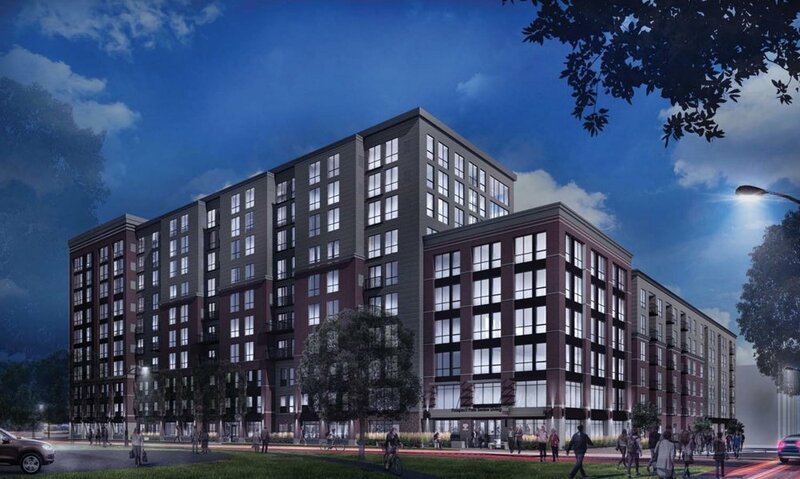 Estimated to cost $36 million, the six story building would include 115 market rate apartments with 20% being reserved for individuals making 60 percent or less than the median income along with four for-sale townhome units. The ground floor would include a restaurant with a separate bakery and coffee shop by local restaurant owner Kim Bartmann. The building would also include a police substation and a dog park. Running behind the building would be a pedestrian walkway connecting Washington Avenue and 2nd Street. The city has also received another proposal from Grand Real Estate Advisors. Their proposal is also a six story mixed-use building that would include residential units. The difference is in the type of residential units. GREA is proposing 48-52 condo units that would be priced between $350,000 and $1.3 million. The development would include a 3,000 square foot space for a restaurant and bakery on the first floor. Like the Sherman Associates proposal, a dog park would be included on site. One of the major differences between the two projects is the affordable housing aspect which was one of the main requests from the city. Sherman Associates proposal would include affordable housing on site while GREA is currently in discussions with City of Lakes Community Land Trust on a way to include affordable units elsewhere in the city. The city of Minneapolis will select a proposal and authorize a land sale at the end of the summer. The Whittier neighborhood is about have an abundance of life brought back to what currently is a bleak corner on one of the city's busiest roads. REX26 is the name for a project planned at the corner of 26th Street and Lyndale Avenue South. The 4 story mixed-use building would house 100 residential units and 18,982 square feet of retail space. It would be a great addition to the surrounding area as the retail space is planned to house a full service grocery store. The site was originally home to the Rex Hardware store which was constructed in 1914 and stood for nearly 100 years. In 2011 the building, after many years of neglect, was demolished and the has since then sat vacant except for a few public gardens. Plans were announced late last fall for Rex26, a new mixed-use development that would be constructed on the vacant corner along with the sites of four adjacent houses. The formal plans for the development will go before the city planning commission at their April 14th meeting. The most recent plans show a four story building that stands 167' 2" tall. Designed by RSP Architects, the building facade makes use of modern materials such as metal and brick, along with large spans of glass. Apartment units on the upper four floors will also include balconies. While some may look at the design of the building as too modern and out of touch with the neighborhood, we think it actually could set a very good precedent for future buildings that will undoubtedly line the avenue. 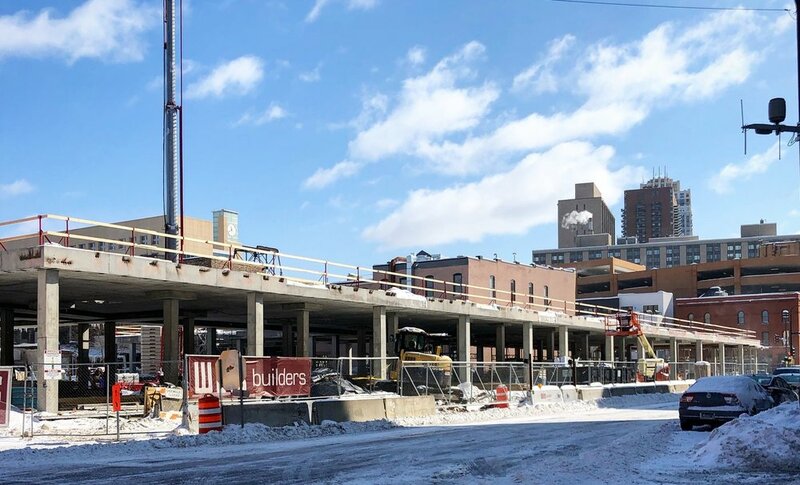 At five stories tall the structure takes into account the surrounding low-rise buildings and strays away from the standard maximum 6 story height that developers are able to achieve in Minneapolis wooden construction. The design also aims to utilize "blocks" making the building appear as separate buildings, instead of one large hulking mass. Now regarding that full-service grocery store that would be brought to the neighborhood. The developer "accidentally" mentioned Aldi as the grocer to occupy the ground floor space when the plans were originally presented in the fall. Since then no official retailer has been announced and the idea of Trader Joe's opening in the space have been shot down (the two companies are part of the same family). If approved by the planning commission, construction on the project would begin this summer. With a 13 month construction time frame the project would be complete by late summer 2017 with the main floor retailer opening most likely in the Fall. Another empty lot in the North Loop may soon become a sprawling 10 story office building if one developer has their wish. The thing is, you probably won't even notice as that's how perfect this building will fit in to the surrounding area. CPM Development this past fall purchased what currently is a mixed-use building along Washington Avenue North called the Internet Exchange Building. The property included a surface parking lot behind the building and from the day the purchase became public questions began to be asked on what CPM would do with the parking lot behind the building. 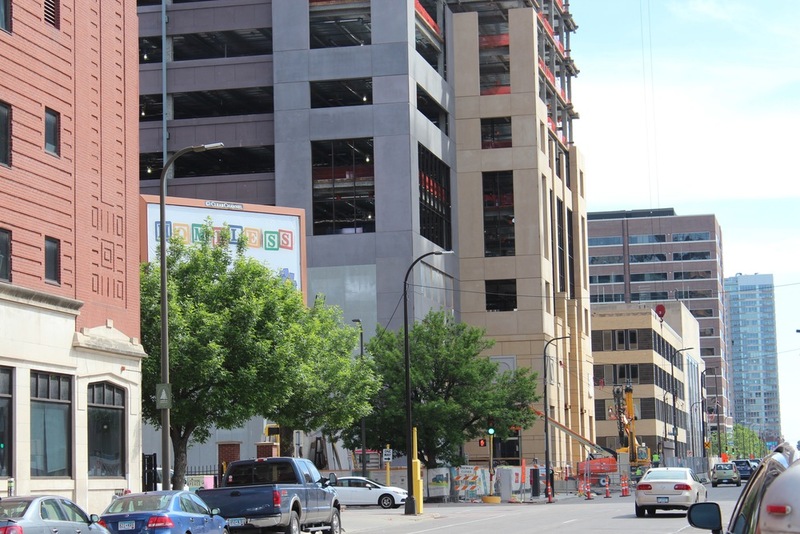 As most know, parking lots these days in Downtown Minneapolis are limited and if they don't have a development planned on them now, they soon will. 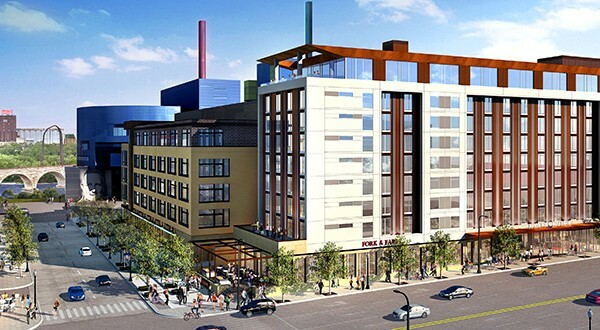 CPM will present plans to the Minneapolis Planning Commission on March 31st for a new 10 story building to be constructed on the surface parking lot at 419 Washington Avenue North. 77 parking spaces will be included in the project on one sub grade level along with the ground floor. The rest of the ground floor will be space devoted to 7021 square feet of retail while floors two through ten will feature 23,420 square feet of office space per floor. The retail space is currently designed with two sets of doors from the streetscape which means the space could be subdivided. However when you think about how hot the North Loop area is recently when it comes to the restaurant scene it seems very likely that this perfectly sized retail space will be snatched up by another restaurant spearheaded by one of Minneapolis' finest chefs... and we're not complaining. It's gorgeous and very well designed. To be honest, we don't know how quite to describe it... besides the text below. The ten story (11 including the below grade parking level) structure features a design that is perfect for the North Loop. Clad in brick from head to toe, well...ground to cornice, the building gives off a strong vintage vibe that is sure to fit in with the surrounding buildings. DJR Architecture is responsible for the overall design which features large expansive "warehouse" styled windows along with numerous arched windows. Something we believe should be noted is the fact that DJR treated the front Northeast facade of the building along with the back Southeast facade (which faces the railway and is across from Dock Street Flats and T3, and office building which is currently under construction) as equal primary facades. This means that both are rich in detail, including full brick work and arched windows. It's an attention to detail that really is going to make a difference. We here at The Development Tracker are extremely excited about this excellently designed building that is planned for an iconic Minneapolis neighborhood. We can't wait to see the shovels hit the ground! Uptown Target enthusiasts, your wish has been granted. On Friday Target officials confirmed that a new store will open in October 2017 in a new mixed-use development on the site of the former Cheapo site. Literally the heart of Uptown. News that Target is officially coming to Uptown isn't necessarily "new" news. There's been plenty of speculation of what tenant would open in CPM Development's new Lake & Fremont project located at 1300 West Lake Street and 2928 Fremont Avenue South. The project will bring a new $40 million, 6 story mixed-use building featuring 125 apartments, 5,000 sqf of second floor office space and of course retail space for Target. The drawing factor for Target to this project was the fact that it not only was in Uptown, but also that the project included 21,000 sqf of continuous commercial space on the ground floor which is uncommon for new projects in the Uptown area. Target was a logical tenant due to the fact that the company has been waiting to make an entry into the heart of Uptown for a number of years now. The problem was that Target didn't have a store design that was small enough for the neighborhood... That is until last year of course. That's when the company introduced what then was known as Target Express, now simply as just Target, to the Dinkytown neighborhood and the world. Target's small footprint prototype now has a number of locations across the United States and is the company's biggest focus regarding expansion for the next year. Target's new location will feature one level of shopping covering 21,400 square feet. Within the space Target will sell men's and woman's (possibly kids) apparel, groceries and ready to eat-meals, household items and more. 23 parking spaces will be available for those who decide to drive to Target's new location, however most are expected to walk. The location will also feature a CVS in store Pharmacy (it's a new concept beginning to be rolled out this year since CVS bought Target's pharmacy operations last year). Renderings also show a Starbucks sign in the window however that detail was not confirmed by company officials. CPM plans to begin demolition of Cheapo's former space this week with construction of the building beginning immediately after demolition is complete. Construction is expected to be complete in early Fall 2017 with Target opening in October 2017. The details are here for a project announced last year by Jim Graves, CEO of Graves Hospitality and founder of AmericInn. We're talking about 3041 Holmes Avenue, a new mixed-use project near the heart of Uptown. A few minor changes have occurred since designs were last shown for the project this past summer. To the naked eye it pretty much looks the same... and that's because it essentially is. What has been decided is what the project will include regarding its residential units. Ladies and Gentlemen, they'll be luxury condominium units. The six story project will include nine dwelling units that will be available for purchase. While original plans for the project included a restaurant and bar on the first floor, the most recent plans have shrunk that down leaving a 1,000 square foot retail space at the corner of 31st Street West and Holmes Avenue South. Residents within the building will have access to amenities such as a bike repair and maintenance space, fitness room, and library. The ground floor will also include parking area with 18 stalls that will be accessible from Holmes Avenue S and completely screened along with three individual garages on the alley side. Residential units will number two per floor except the sixth floor which will feature a single penthouse unit. Each unit will include an outdoor patio and/or a deck space and of course a high quality, fully customizable, luxury interior. 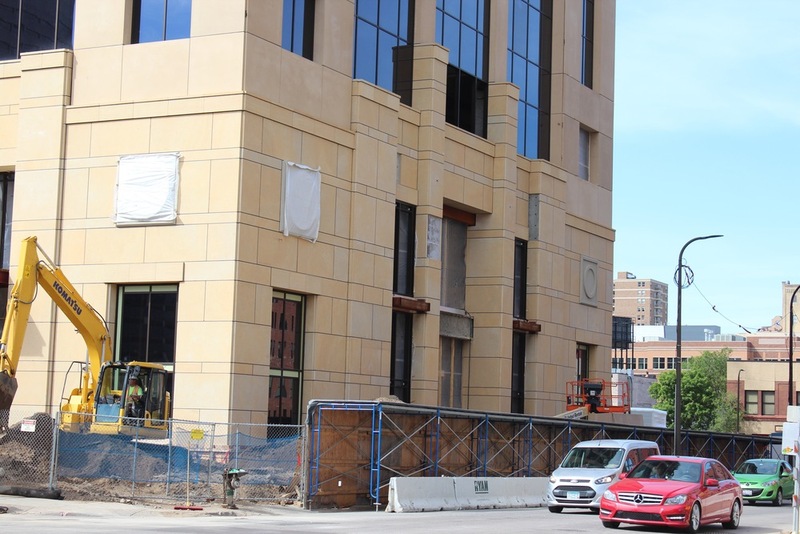 Overall the building will be a nice addition to Uptown featuring quality materials including stone with granite accents, cast stone and metal. Developers are requesting a variance for lot coverage as the maximum allowed is 70 percent and the project occupies 84.8 percent according to documents submitted to the city planning commission. 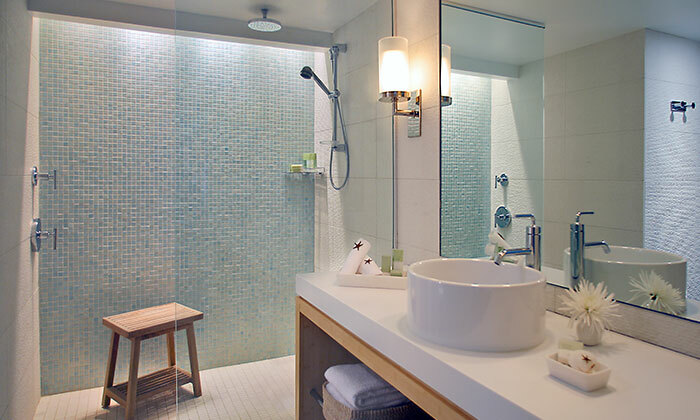 Collage Architects is responsible for the design of the project. If approved, construction could begin as soon as early Summer. More housing is on the drawing boards for Uptown. The site of Cheapo Records is scheduled to be purchased by CPM Cos. in the fall in order to make way for a six story residential building that would feature apartments along with retail and office space. 20,000 square feet of retail space is planned for the ground floor (likely to house a restaurant among other retail tenants) and 5,000 square feet of office space is planned for the second level. At the moment the exact number of apartment units planned for the project has yet to be disclosed. And for all those who love Cheapo there is no need to worry about them disappearing. Currently they're currently looking for a new location within the neighborhood to move to once their lease expires in August. Above: Cheapo's Uptown location. The Walkway luxury apartments are located directly behind the site. The project would be directly next to The Walkway, a 92 unit luxury (and when we say luxury we mean LUXURY) apartment building that opened last year. It also would be blocks away from the new condominium project announced last week by Graves Hospitality. ESG Architects is behind the design of the project. It features what appears to be a gold, grey, and white color scheme. At the each corner there are seven story "end caps" that feature large balconies. It appears that almost all the units in the building would have a balcony. If all goes according to plan CPM hopes to close on the site in the fall and have construction underway by February 2016. 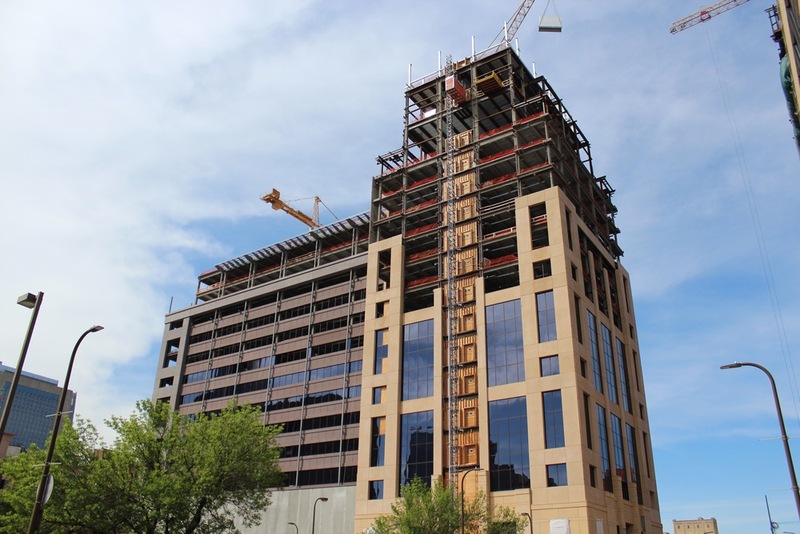 The new Wells Fargo Towers, the focal pieces of the new Downtown East redevelopment, have officially been topped out (look for the tree on top of the building on the left in one of the photos below). The twin 18 story structures are scheduled to be completed for January 1st, 2016. With the physical bones of the structures in place the facade work has begun stretching towards the skies. Ryan Companies has also begun work on prepping the two blocks that will become home to "The Commons", the two block park that will be the centerpiece of Downtown East. You can see the recently released renderings for that project here. 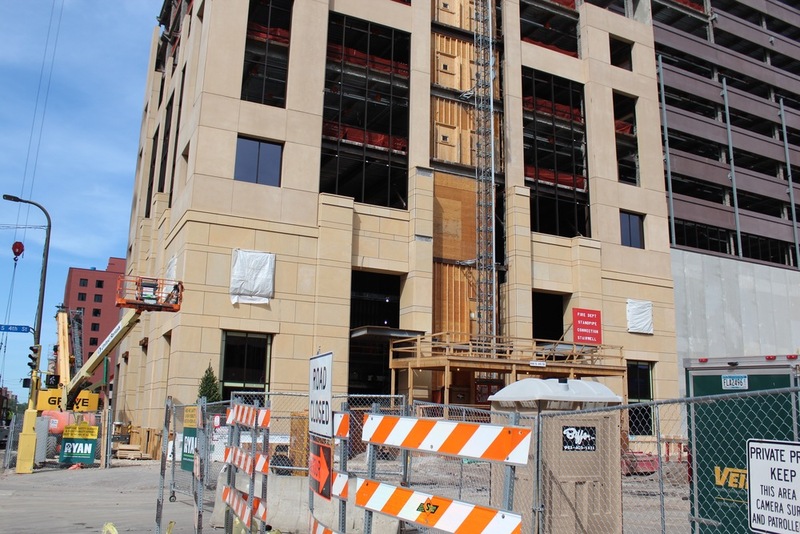 Below we've included a number of photos showing the current construction status of the Wells Fargo Towers. One of the last surface parking lots abutting Hennepin Avenue is about to be snatched up as Ryan Companies and Shorenstein Properties plan another boutique apartment project. The Minneapolis/St. Paul Business Journal broke news yesterday of plans for a 159 unit apartment project with first floor retail. The development is to built on a surface parking lot currently sandwiched between the Federal Reserve Building and Ryan Companies' 222 Hennepin apartment project. 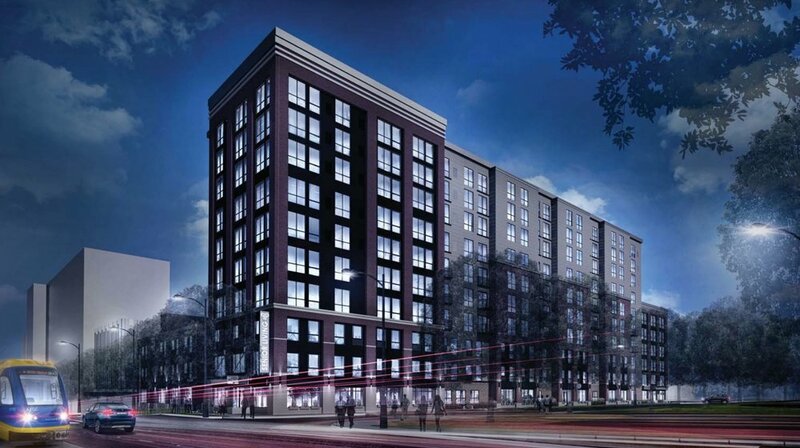 Designed by Minneapolis based ESG Architects, the new boutique apartment complex will stand six stories tall. Within the main building there will be 159 market-rate apartments with rents a little over $2 per square foot with retail being located on the first floor of the building at the intersection of each block. In addition to the main building 11 three story town homes will also be construction on the opposite side of the ramp on First Avenue North. Shorenstein Properties already owns the site parking lot along with the large parking ramp next door. The plan is to capitalize on all the available parking by including resident parking for the within the adjacent ramp. Developers also plan to construction 46 parking stalls on the first level of the project. If all goes according to plan regarding approval from the city of Minneapolis shovels could hit the ground in Spring 2016 with an opening one year later in Spring 2017.